^ a b Ágoston, Gábor (2009). "Süleyman I". In Ágoston, Gábor; Bruce Masters. Encyclopedia of the Ottoman Empire. p. 541. ^ a b Ágoston, Gábor (2009). 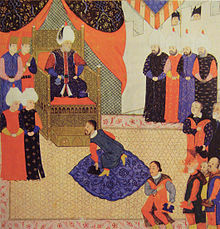 "Süleyman I". In Ágoston, Gábor; Bruce Masters. Encyclopedia of the Ottoman Empire. p. 545. ^ Ágoston, Gábor (2009). 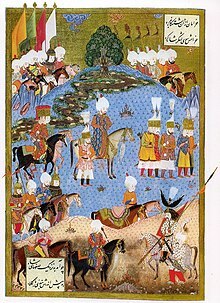 "Süleyman I". In Ágoston, Gábor; Bruce Masters. Encyclopedia of the Ottoman Empire. pp. 541–45. ^ Cemal Kafadar (1993). "The Myth of the Golden Age: Ottoman Historical Consciousness in the Post-Süleymânic Era". In İnalcık, Halil; Cemal Kafadar. Süleyman the Second [i.e. the First] and His Time. Istanbul: The Isis Press. p. 41. ISBN 975-428-052-5. ^ Heath Lowry (1993). "Süleymân's Formative Years in the City of Trabzon: Their Impact on the Future Sultan and the City". In İnalcık, Halil; Cemal Kafadar. Süleyman the Second [i.e. the First] and His Time. Istanbul: The Isis Press. p. 21. ISBN 975-428-052-5. ^ Alan Fisher (1993). "The Life and Family of Süleymân I". In İnalcık, Halil; Cemal Kafadar. Süleymân The Second [i.e. the First] and His Time. Istanbul: Isis Press. p. 9. ISBN 975-428-052-5. ^ Quoted in Alan Fisher (1993). "The Life and Family of Süleymân I". In İnalcık, Halil; Cemal Kafadar. Süleymân The Second [i.e. the First] and His Time. Istanbul: Isis Press. p. 2. ISBN 975-428-052-5. 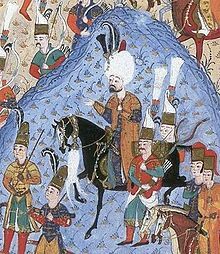 ^ Muhibbî (Kanunî Sultan Süleyman)(in Turkish) In Turkish the chronogram reads شهزاده‌لر گزیده‌سی سلطان محمدم (Şehzadeler güzidesi Sultan Muhammed'üm), in which the Arabic Abjad numerals total 955, the equivalent in the Islamic calendar of 1543 AD. ^ Freely, John (2001-07-01). Inside the Seraglio: Private Lives of the Sultans in Istanbul. Penguin. 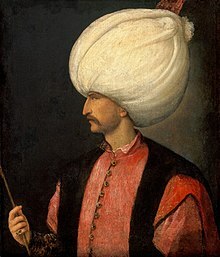 ^ "Ottoman". 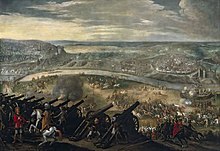 theottomans.org. Retrieved 2016-02-03. ^ Ágoston, Gábor (2009). 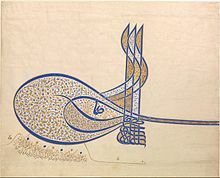 "Süleyman I". In Ágoston, Gábor; Bruce Masters. Encyclopedia of the Ottoman Empire. p. 542. Ágoston, Gábor (2009). 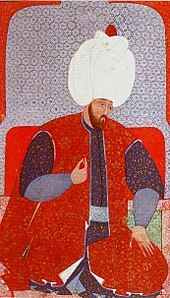 "Süleyman I". In Ágoston, Gábor; Bruce Masters. Encyclopedia of the Ottoman Empire. pp. 541–7. Atıl, Esin (July–August 1987). "The Golden Age of Ottoman Art". Saudi Aramco World. Houston, Texas: Aramco Services Co. 38 (4): 24–33. ISSN 1530-5821. Archived from the original on 6 July 2011. Retrieved 18 April 2007. Kafadar, Cemal (1993). "The Myth of the Golden Age: Ottoman Historical Consciousness in the Post-Süleymânic Era". In İnalcık; Cemal Kafadar, Halil. Süleyman the Second [i.e. the First] and His Time. Istanbul: The Isis Press. pp. 37–48. ISBN 975-428-052-5. "Suleiman The Lawgiver". Saudi Aramco World. Houston, Texas: Aramco Services Co. 15 (2): 8–10. March–April 1964. ISSN 1530-5821. Archived from the original on 5 May 2014. Retrieved 18 April 2007.